These simple, single piece multitools seem to be the newest trend. Gerber’s Artifact and Shard are going to face some serious competition now that the Raleigh Tabor designed SpareTool is out and about! This clever little multitool from Columbia River includes a small but hefty blade, an embedded screwdriver bit which can be used to turn the tool into a T-driver, a bottle opener, a nail lifter, and more. The tool locks into a secure kydex sheath with a handy belt clip. We like this tool, and we think you will too. And at this price, why not add it to your next order? Danish design and Solingen, Germany manufacture…you know it is going to be a beautiful product. Beautiful is the perfect word to describe the Gorm series of kitchen knives from Boker and custom knifemaker Jesper Voxnaes. The design is innovative, and as functional as it is striking in appearance. The steel is 440C and the handles are milled Micarta, giving you a very durable tool all the way round. Even the block is like nothing else on the market. Kershaw Speedform– Winner of Blade Magazine’s 2009 American Made Knife of the Year, it has finally arrived! They are beauties, too. Great style and solid feel.3-3/4″ CPM-D2 blade and Titanium handles with a frame lock. Out of all the Kershaw Leek versions that were available several years ago, the gold ones were our favorites. Though we are not normally drawn to bling, these Gold Leeks stood right at the edge between cool and obnoxious. Now, they are back for a limited run, and you can own one at a great KnifeCenter price of only $59.95! New Pocket Bowie Knife from Boker and Tom Krein! When we first heard about the Pocket Bowie, we were skeptical. 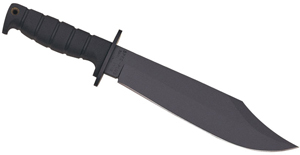 One of the defining features of a Bowie knife is the large blade. What would a Bowie be, we wondered, without the size? 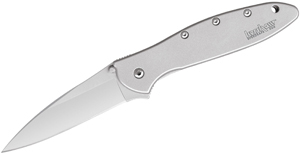 But the new Pocket Bowie from Boker and Tom Krein has made believers out of us. The shaving sharp 2 1/2″ blade is small enough to be hidden under your shirt as a neck knife, but it feels like a larger knife. Maybe it is just the attitude that this knife has in comparison to other neck knives, but the spirit of the Bowie knife clearly surges beneath the steel of this blade. The distinct Bowie blade is coupled with a very grippy G-10 handle. A tight, Tek-Lok compatible Kydex sheath completes the ensemble. Just in time for hunting season, check out this great hunting knife from Buck. The winter camo gives it a very distinct look, but it is all Buck underneath. The handle is rubber for lots of grip and no hand fatigue. 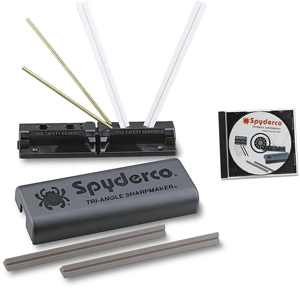 The blade is 420HC, so it will take an edge in the field without a hassle. Made in the USA. Smith & Wesson makes good quality knives, with great designs, at exceptional prices. Their latest offering is the Extreme Ops Lockback with aluminum handles. The size is just under 5 inches closed with a blade just under 3.5 inches…perfect for the working man’s every day carry! And the working man can afford it at the KnifeCenter, where it is only $12.95! This knife is a great gift to yourself if you are looking for a solid knife at a great price-only $19.95 at the KnifeCenter. It is also a great gift for a soldier, as it celebrates the 235th anniversary of the US Army. The knife features a wire cutter feature in the handle, as well as a complete black titanium coating. The gift tin features wonderful graphics celebrating the history of this noble branch of our military.